The children are heading back to school in my area. I see them waiting at the bus stop. The little ones are accompanied (mostly) by mothers with coffee cups. The middle schoolers work hard to look cool, while the high schoolers who are too young to drive work hard to look bored. Back to school time is bittersweet to me. Even though I’m long removed from school or even sending my kids off to school, I still think of September as the beginning of the new year. January 1 is just an excuse for a good party and a signal we need new calendars. Back to school also signals a poignant (to me) end, the end of summer. We moved a lot when I was young. Most moves were to nearby towns, just far enough for a school change and too far to maintain a childhood friendship. Each year we started over. Going back to school was an opportunity to meet the kids at my new school. When I was young, I thought it was exciting making new friends. As I grew older, I longed to be with the friends at my old school. Being the new kid was an advantage. Everyone wanted to get to know me. Eventually, I’d settle in to a comfortable of group friends. The hard part was leaving those friends at the end of each year. I can still remember so many experiences from my school years, some as seemingly ordinary as the dress I wore my first day of first grade. I loved that dress. It was a smock dress of a fabric that looked like a gray chalkboard covered with white writing. It had a portrait collar with a big red bow at the neck. I wore my new red and white saddle shoes that day. Actually, I think in first grade those shoes were my only school shoes and I wore them with everything. When I attended the same high school for a few years, I remember those first days each fall. We moved through the hallways connecting with the friends we hadn’t seen during the summer. Entering each classroom, we scanned for the room for old friends keeping an eye out for new boys we hadn’t met. 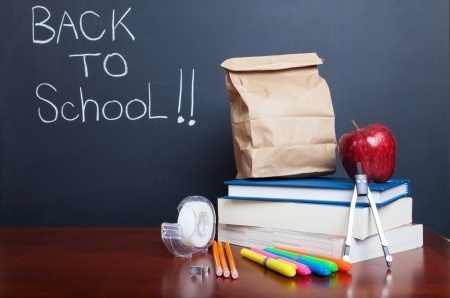 What are some of your back to school memories? Were they happy memories or were they struggles? This entry was posted in Family, Holiday, Memories, Personal History, Stories. Bookmark the permalink.